BDS Engineering is authorized distributors for the Varem® water tanks and bladder water pressure tank. Maintains equal water pressure in entire system. Widely used to withstand water hammer in pressurized systems. The VAREM™ tank made of steel never corrodes and no harmful traces of metal are passed into your water. The tank is made of Food & Drug Administration (FDA) and National Sanitation Federation (NSF) listed materials, thus environmentally safe and will not introduce any undesirable chemicals or elements. The membrane tank is suitable for all kinds of water, even corrosive water with high levels of calcium. The water only comes into contact with the membrane, therefore eliminating the possibility of corrosion. The membrane is easy to replace. Suitable for usage in drinking water systems, which use Reverse Osmosis technology. The membrane which does not rub against tank wall, will have longer life. OSMOVAREM for Reverse Osmosis and filtration systems. SOLARVAREM for solar energy systems. INTERVAREM for water booster systems. MAXIMATIC-SN for industrial heating systems. FLATVAREM for wall heater systems. PLATEVAREM for plate heat exchangers. ZINCVAREM for zootechnical plants – hostile climatic environments. VAREM Water Storage Tanks are built tough to last. 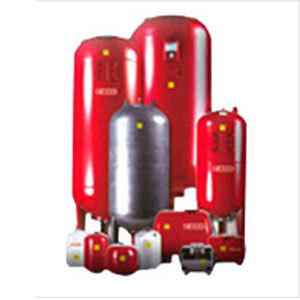 As a result, they've long been known as the world's most reliable Pressure tanks. Our tanks are individually tested, making them extremely safe. They're designed to meet the most demanding specifications for potable water. No one offers a broader line of tanks than we do. So, when you're looking for a Pressure tank for a specific application, you can be sure we'll have it for you.